WELCOME TO NO HAVEN'S HOME PAGE. 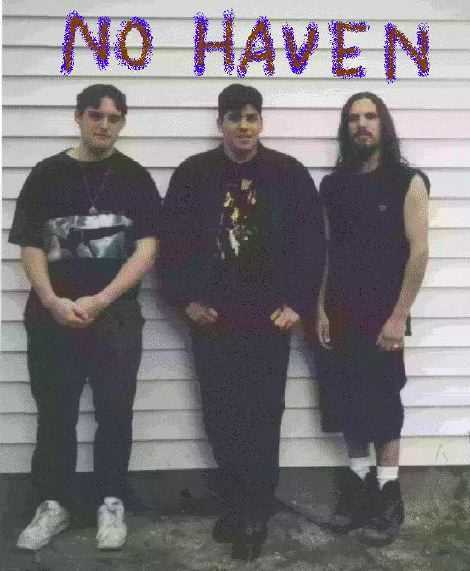 NO HAVEN IS A HARD ROCK BAND FROM NEW JERSEY. WE HAVE JUST STARTED WRITING OUR OWN MUSIC. WE HOPE TO PLAY CLUBS IN THE NEAR FUTURE. IF YOU WANT TO LEARN MORE ABOUT US CLICK ON THE LINKS BELOW. SPECIAL THANKS TO JEFF CONKLIN FOR HELPING US TOUCH UP OUR PAGE AND TO MIKE'S FRIEND WHO TOOK THE PICTURES. WHEN i FIND OUT YOUR NAME I WILL PUT IT ON.